Here we have even more information on the B & G wood inlay company. The main piece on this page deals with the methods B & G adopted for selling the company's work. B & G sold much of their output through this very method. It will probably bring back a lot of very similar memories to many of the present day B & G marquetry picture owners. If you can help us with any further information on the B & G company, would you be so kind as to contact us by clicking the link to the right of the article below. Thanks for your help. Although we have acquired a plentiful supply of information regarding the Buschmid & Gretaux Wood Inlay Company, we have yet to let you know how they went about acquiring their appreciative and eager customers. They sold a good deal of their work through the usual retail channels, but however, not only did they sell their works in the traditional way, and through the traditional outlets, they also had a somewhat unique market place for their products! B & G took good advantage to sell their unique wares to one of those appreciative and astute groups of potential marquetry picture purchasers by selling directly to the American Forces through their various bases around the world. Here is a description of just such a purchase of one of those above mentioned B & G marquetry pictures, which may well "ring a few bells" with some of you. We gratefully thank Emily Rivard for sharing her memories of the B & G experience with us. I was recently doing some internet research on my German wood inlay picture and came across your articles on this very subject. It's a shame to see that the Buchschmid & Gretaux company has now just faded away. From 1976 to 1978 my husband and I were stationed at the U.S. Naval Air Station in Keflavik. Iceland. I worked for the Navy Exchange there, in layaway and special orders. Once a year, Will Heuvals of the Buchschmid & Gretaux company visited and took orders for pictures similar to those you have displayed on your pages. He brought samples and we would take deposits from customers who would have to pay off the full price of the piece in three months. After about five months, the pictures would arrive. Will (I’m pretty sure his name was Willhem) was in his mid to late 60’s then. He was a cheerful and friendly man, and everyone in the store enjoyed his visits. 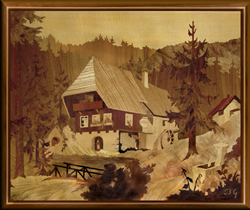 In ‘77 we ordered a picture, the biggest one we could afford, an 18" x 24" version of the “Black Forest Mill” design. The frame is the same as the pictures on your page. Neuschwanstein Castle was one of the most popular pieces, and in fact, we almost purchased that one ourselves. That size picture cost $375.00. and was a huge investment to us back then. There were smaller ones available, and one or two six inches larger. There is no label on the back of my picture, just a finished sheet of beautiful wood. The BG signature is the same, in the lower right corner. We were given a pamphlet about the work I recall, but that unfortunately went missing years ago. During the order taking, my husband and I had occasion to chat a long while with Will, who told us that the company had been in business for a very long time, but was sadly dying out. He said it was just himself and one other man of about the same age, who were making the pictures. His market was the Exchanges. He traveled once a year to the European bases to take orders, and he said it was enough business to keep the two of them busy, but once they were gone, so would be the company. I don’t know much about marquetry myself, but I do remember that he made a very proud distinction between what he did and what others, like the Italian companies, were producing. He was disdainful of the Italian pieces the Exchange sold off the shelves. They were made with a saw, he said, and not made with “the wood in mind.” I had the impression he made each piece somehow by hand. That was over 30 years ago. Willhelm and his partner are now long gone I’m sure, and so probably, has the B&G wood inlay company. My Black Forest Mill marquetry picture, however, just grows more warm and beautiful as the years pass. Thanks for that insight into the selling methods adopted by the B & G wood inlay company Emily - we think your detailed recollections will bring back similar memories for many present day B & G picture owners. It is information like this that really helps us to build up a comprehensive history of a superbly talented company dedicated to producing marquetry pictures of the highest standards. We offer our thanks to all of you (and there has been a surprising amount of you!) who have sent in information and photos relating to the B & G company. It is much appreciated by everyone themselves who, along with us, appreciates and enjoys the fine work of B & G.
Robert Swanson very kindly sent in the following information on the surviving remnants of the once exalted B & G wood inlay company. "I've been looking for, and checked out, anything I could find regarding the fate of the B & G wood inlay company. Regretably, the house (or premises) and the wood or veneer store shed does not exist any more. Only a small sign at the fence reminds visitors of the business. A neighbour told me that the owner died some years ago, and there was no successor. So, everything was torn down and some new houses were built on the ground. I still remember the treasures in his veneer shed. Sorry"
Well, I think from the above information we can now assume that any material remains of the original Buchschmid & Gretaux wood inlay company (except for their very collectable marquetry output) have long since gone from memory, and all those skills, and associated wood inlay knowledge, have now been lost along with the original company. Thanks once again to Robert and Klaus for bringing us up to date on the ultimate fate of the Buchschmid & Gretaux wood inlay company. Click the above button to return to page 5 of "Can You Help"
Click the above button to visit page 7 of "Can You Help"